Camping with kids is an experience your children will remember for a long time to come. 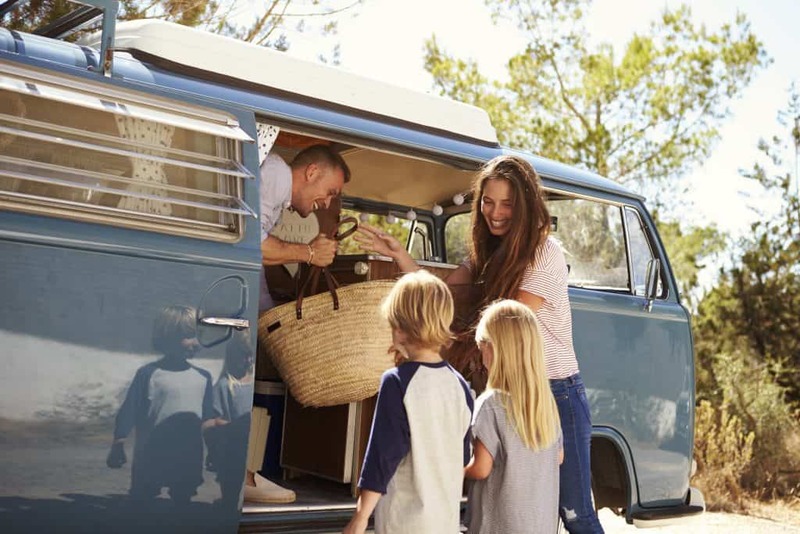 Family memories are made when you do things that include them, and it’s worth the extra planning and effort to take the kids camping when you go. There’s going to be more gear to bring along and less down time for parents, but the benefits are worth it. Unplugging the whole family and getting back to nature can be a relaxing and rewarding opportunity for family bonding. 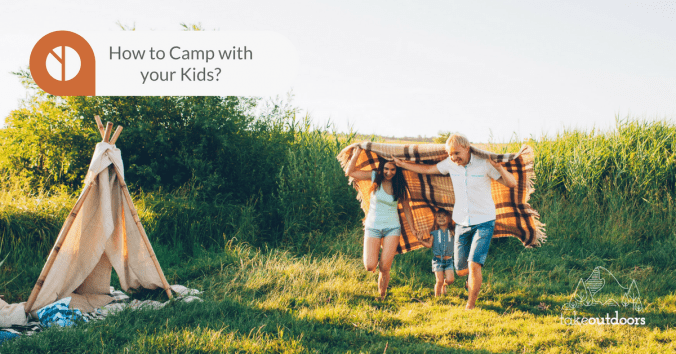 You may be asking yourself, “What do I need to do for camping with kids?” To start with, preparation for a family camping trip can take as long as the camping! The kids can and should be involved in this phase of your new adventure. 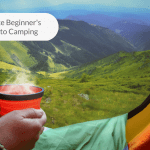 We’ve gathered some suggestions, and we’ll help you with what to take along and how to “practice” camping at home. There’s also a lot of good advice here on how to stay safe and enjoy your campout to the fullest. Start talking about camping with your children by describing the fun things you can do, like roasting marshmallows and singing camp songs. If you’re planning on camping with your kids at a park that has water features, that’s another thing to talk about that will ramp up the excitement. Find movies to watch together that give a positive picture of camping. Read stories about kids who like camping, and bring the books along when you go. One tip when planning what to pack for a camping trip with kids is to start thinking about it way ahead of time. Make a list of everything you would take with you on a regular trip, for starters. Camping with a four-year-old is different from camping with an older child, but there are certain things that you’ll need, whatever the kids’ ages. Be sure to keep the weather in mind when you start making plans for your family campout. It’s easy to Google the park sites to find out the best times of year to camp. Check the local forecast for the weekend you have in mind before you go. If there’s going to be a drenching downpour the whole time, it’s best to reschedule, especially if it’s your first camping trip with the kids. It’s also a smart idea to test your equipment ahead of time. Make sure the air mattress doesn’t have any leaks and the zippers are working on the sleeping bags. Go ahead and put fresh batteries in the lantern and flashlights. And make sure you remember how to set up the tent by pitching it in the backyard. This will also get your family ready for another phase, a backyard camping trial run! Let your kids help plan the camping trip and listen to their suggestions. Even if you have to modify their ideas a bit, give them credit for making the campout a fun experience. If little Sally suggests bringing along the family trampoline, you can end up hanging a rope swing from a tree instead. Being included in the planning is a fun part of camping for kids. Give each child over five years old a list of things to pack and let them do it themselves. You can always check later to make sure they have everything they need. Older kids can help roll up sleeping bags, pack food and assist with setting up the tent once you get there. Talk about the camping trip for weeks before your family goes on it. This will give the little ones a chance to ask questions and get used to the idea of camping. It’s also an opportunity for you to manage their expectations. Let them know whether you’ll have a campfire, if swimming will be involved, how much family hiking you plan to do, and other details. Your attitude will set the example when camping with the kids. If you’re excited and happy about it, they will be too. Even though you may be bombarded with questions and suggestions, continue to be upbeat and excited about the trip. Once the family gets to the campsite, a positive outlook will help a lot when there are small setbacks. After all, any problem can be viewed as an adventure with the right attitude. Do you remember camping in the back yard when you were a kid? Those of us who are fortunate enough to have had this experience will never forget it. To a kid, staying in a tent in the backyard is nearly the same as camping in the wilderness, except that you get to go inside to use the bathroom and get more Oreos. This is a fun way to get your children accustomed to camping out. For kids, everything out of the ordinary becomes an adventure. And the littlest things excite them, like picking out their own flashlights and hats. It doesn’t matter if their sleeping bag has the latest Disney theme or is a plain one. All that matters is that it’s new to them, it’s different and, most of all, it’s theirs. Start by letting your children choose their own flashlights and pick out some glow sticks. You can also get inexpensive necklaces and bracelets made of glow tubing, adding even more fun to the campout. Walk around in the woods near your home at night to give the kids practice using their flashlights. Another unique way to light up the surrounding area is to wear a headlight that straps onto the forehead. This is a good trial run for your cooking equipment, too. Whether you’re going to use a campfire or a portable cook stove, you can practice your setup at home first. It doesn’t have to be an elaborate meal – a wienie roast with toasted marshmallows will thrill the kids. Part of the fun could be picking out their own sticks to sharpen for cooking food over the fire. If you want to make it more realistic, your family can agree that no one goes inside unless it’s to use the bathroom. Pack a cooler with all the food you’ll need for your campout, and if you forget anything, you’ll have to “rough it”. If you don’t want to dig a fire pit in your backyard, a small hibachi stove will work fine for grilling food. Backyard camping gives the whole family a chance to work together, hang out, tell stories, and prepare meals. Electronic devices should be left in the house to allow everyone to interact with each other. 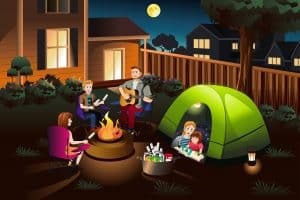 There are a lot of fun backyard camping ideas for children, like a scavenger hunt or “jungle adventure” with surprises stashed around the yard. It’s a great rehearsal for your first camping trip with kids. You can prepare even more for the big camping trip by taking a short, overnight trip to a campsite in your immediate area. That way, you’ll be close to home in case anything comes up or you forget an item that you need. Hopefully, the kids won’t want to leave when it’s time to go, building up their enthusiasm for the next family campout. This will also be another chance to tweak your list of camping with kids essentials. To keep from bringing too much, use sealed plastic containers for just the amount of food you’ll need instead of bags and boxes of food. At warehouse stores, you can get boxes of condiment packets that are more convenient and take up less room than jars. The grocery store has sets of cardboard salt and pepper shakers that are lightweight and disposable. Helen Olsson, author of The Down & Dirty Guide to Camping with Kids, says duct tape is a key item to bring along. It makes a good splint for sprained fingers and she’s used it to mend everything from tent poles to sneakers. Another suggestion is to camp with another family. It’s an effective way to keep the kids occupied (with each other), and it’s a relief to share the parenting load. If you forget to bring something, chances are the other family will have it. Olsson recommends bringing items that are familiar to the children and/or are frequently used. If you’re bringing a toddler along, you’ll need a portable crib. It will be worth the extra weight to keep your little one safe while you set up the tent and during the night. If any of the children are just beginning to be potty-trained, bring the potty-chair along. If nothing else, you can use it at night instead of lugging your toddler to the restrooms. Children are active and always looking for something to do. Take a table tray for playing cards, and bring along the kids’ favorites like Old Maid and Go Fish. Bring regular cards, too. You can play a lot of different games for the whole family with them, and even make up some new ones. Travel-sized games are great for the car. Once you get there, the little ones will want their sand toys, especially if you find a shallow stream to play in. Frisbees and balls, bubble wands, and even paint are clever extras for keeping the kids occupied. After all, what better place to make a mess than outside? Here are three basics for keeping the kids occupied indoors: crayons, markers and plenty of paper to color on. You’ll be glad to have these things if an unexpected rain keeps everyone inside the tent for hours. Bring picture books about nature for younger kids, and look for things you’ve seen while you wait for the rain to stop. Check your site when you get there, and clear away any debris that might make the tent floor uncomfortable. Look around and make sure there aren’t any dead tree branches threatening your camping area. Decide the best direction for your tent to face and lay it out so that it can be set up that way. When you first get to the campsite, go for a family walk to orient everyone. Help the kids count how many spaces your tent is from the bathrooms. Continue to involve them in the camping experience by giving them small chores to do while you’re camping. Gathering sticks for the fire, sweeping the campsite, laying a tablecloth over the picnic table and other responsibilities will help them feel involved. Choose a place for each item that you bring, like clothing, toys, coolers and food supplies. Explain to the children that everything should go back in the same place after use, to keep a neat and clean campsite. Even when you’re camping, kids like to follow a routine, so try to keep mealtimes and bedtime the same each day. 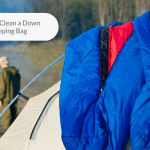 Keeping the tent clean can be a challenge when you’re camping with children. One thing that helps is leaving shoes outside the tent. Spread a five-foot-square heavy-duty tarp in front of the tent entrance, and line the shoes up on one side of it. If your tent doesn’t have a front flap over the door, you can rig one up with a tarp, poles and rope. This will give the family a place to stop and remove shoes, even if it’s raining. If you’re interesting in getting a new durable and versatile tarp for your next camping trip, have a look at our Best Tarps for Camping buying guide. If the kids are going barefoot, place a deep plastic tub full of water just outside the tent entrance with a towel nearby. Have each child step in the water and rinse their feet, then dry off before entering the tent. You’ll also keep the tent clean by not allowing, food, drinks or candy inside it. This has the added advantage of not advertising your presence to local critters. Give your children the chance to enjoy nature at their own pace. Getting from point ‘A’ to point ‘B’ during a hike isn’t the most important part. If the kids want to stop and admire tree fungi or interesting rocks, realize that this is a valid part of the experience for them. Be sure and take the time to point out the constellations at night. The stars can be seen more clearly out in the woods because of the absence of city lights. Does this sound like a lot to memorize? Nevermind, we’ve made a colorful poster (to attract your kids of course!) of the list of camping rules. Print this out and stick it somewhere prominent. Make sure that everyone knows the camping rules. Explain to them the reasons behind each one. For example, that staying together will keep them from getting lost and that taking their shoes off before entering the tent will keep it clean. One of the camping rules for the kids is that everyone in the group stays together when hiking. Accompany small children when they leave the tent to go to the bathroom at night, and have older kids use the buddy system. In addition to their own flashlights, each child should have a whistle of their own. Attach them both to a carabiner that clips to a belt loop on their pants. Explain that they should blow the whistle as loud as they can if they get lost. Make sure everyone in the family is current on vaccinations. Protect your family from the sun with clothing and sunscreen. Watch out for hypothermia and overheating. 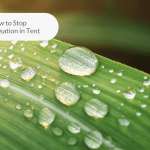 Keep fuel-burning equipment out of the tent. Use safety equipment during physical activity. Bring safe food and water on the camping trip. A tetanus vaccination should be current for all family members, since there’s always a possibility of cuts and scrapes while camping. Make sure that children are up to date on their childhood immunizations, and any pets should be vaccinated too. For camping, an insect repellent with DEET is the best protection against bug bites. Check pets and children for ticks regularly, because they can carry disease. Be sure and apply sunscreen to all exposed areas of skin. Hats and sunglasses with UV coating will also help protect campers from the sun. Long-sleeved wind shirts are breathable and cool, and they block the sun’s rays. Remember that you can still get a sunburn on an overcast day. Watch out for overheating, and make sure that everyone drinks enough water. Dipping a baseball cap in water and placing it back on the head is one quick way to cool down. In the winter, guard against hypothermia by bringing plenty of insulated sleeping bags and blankets. Dress yourself and the kids in layers that can be removed or added to, depending on the temperature. One tip for keeping warm at night is to spread a thick blanket on the floor of the tent before adding air mattresses or sleeping bags. Bringing along enough clothing and bedding to stay warm is crucial, because you won’t be able to warm your tent any other way. Operating fuel-burning equipment inside a tent creates the danger of carbon monoxide poisoning, and it’s a fire hazard. Eating enough and drinking plenty of water while camping will also help you stay warm at night. Use common sense when your family gets physical out of doors. If the kids are climbing trees, putting a bike helmet on them could make a fall less dangerous. Wear life jackets while boating, and tell the kids not to swallow water from streams and lakes because it could make them ill. Make sure everyone has the right shoes for physical activity and that they’ve been broken in before the camping trip. Be sure to bring plenty of food, and include enough ice in the cooler to keep perishable foods cold. One idea is to plan that the refrigerated items will be used up in the first 24 hours of the campout. Then you don’t have to worry about anything going bad. Remind everyone to wash their hands frequently, and bring hand sanitizer for times that water’s not available. Keeping your food and trash away from the wildlife is another safety rule to follow. Raccoons and possums can ruin your food supplies and/or spread trash throughout the camp. Worse, bears are attracted to the smell of food and garbage, and you certainly don’t want to encounter any of them. The best way to keep unwanted company away is to keep food and trash off the ground. One simple way to do this is to hang it from tree branches. All food should be in sealed, airtight containers. Pack your food supplies into a heavyweight trash bag, then tie a piece of rope with a carabiner clip attached to it tightly around the neck of the bag. Next, weight the end of a long piece of rope and throw it over the highest strong branch you can find. Knot one end of the rope tightly onto the carabiner clip on the trash bag, and thread the other end through the clip opening. Then, haul the food all the way up. Reach up high, and tie the loose end of the rope around a large, sturdy twig. Then slowly release the rope until the bag of food stops at the obstacle. This should lift it high enough off the ground to stay out of reach. You can do this for trash as well or, if you’re car camping, double-bagging trash and storing it in the trunk is another option. When hanging food or garbage from tree branches, make sure the bags are several feet out from the tree because animals can climb, including bears. Place your hanging bags as far away from your tent as you can without impinging on neighboring campsites. Bush advises parents to let their kids experience the great outdoors while keeping in mind that they have unique needs when compared to adults. Children get hot and cold faster, they get hungry quickly and they get bored easily. He advises bringing plenty of clothing for them, including quality outdoor wear that fits properly. In hot weather, sunscreen is vital, and a rag dipped in cool water and placed around the neck can cool off a flushed little one. When kids play, they expend a lot of energy. During a camping trip, they’re pretty much going non-stop and will need plenty of high-protein snacks to meet their nutritional needs. Peanuts, beef jerky, cheese sticks and protein bars are all healthy snacks to bring along. Of course, candy and popcorn will be welcome treats, too! Youngsters forget to drink enough water when they’re excited and having a good time. Each child should have a water bottle, and parents need to remind them to drink often. Remember that children have a shorter attention span that adults. Change the activities often so that they don’t get bored with doing the same thing. When you’re doing something, they need to be occupied, too. 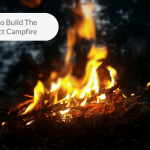 If you’re building a campfire, send them to gather kindling. If you’re preparing a meal, have them set the table and help you cook. Or one parent can lead them in silly songs while the other one works on a chore. Today’s children lead a more sheltered life than in previous generations when it comes to playing outdoors. There’s a lot less roaming through the woods unattended, in part because there’s less open space in most cities. Many parents also believe that having a full week of after-school activities helps their children stay out of trouble. It probably does, but it’s a shame that this generation doesn’t have the same opportunity to explore the outdoors. Camping is a way to give your kids that relationship to nature, and it also fosters independence. Children feel empowered when they help set up a camp, cook, clean up and share decision-making responsibilities. 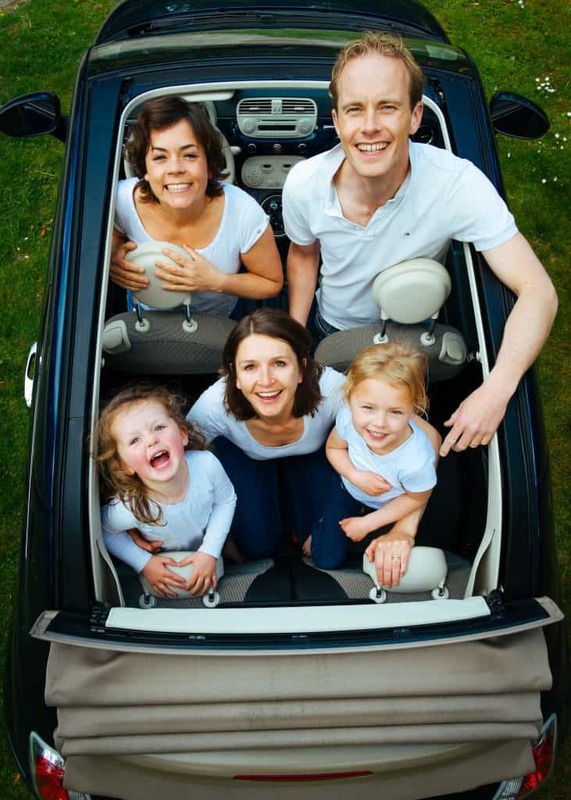 It’s a powerful way for a family to bond without the distractions of electronic games, smart phones, computers and television. Everyone benefits when parents help their children learn to enjoy and appreciate nature. 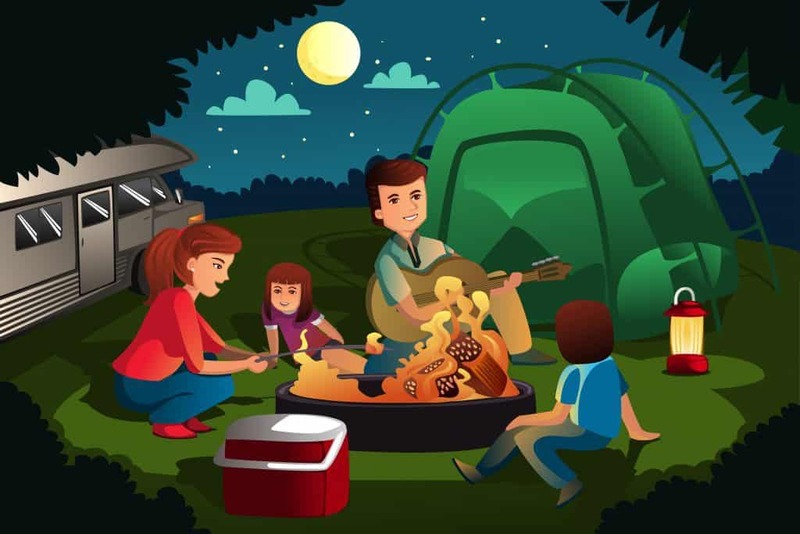 Hopefully, these tips will help your first camping trip with kids end up being delightful experience. What are the Best Hammocks for Camping? 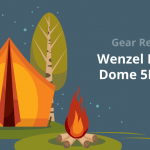 What are the Best Car Camping Tents?